THEMIS Image of the Day, April 24, 2019. 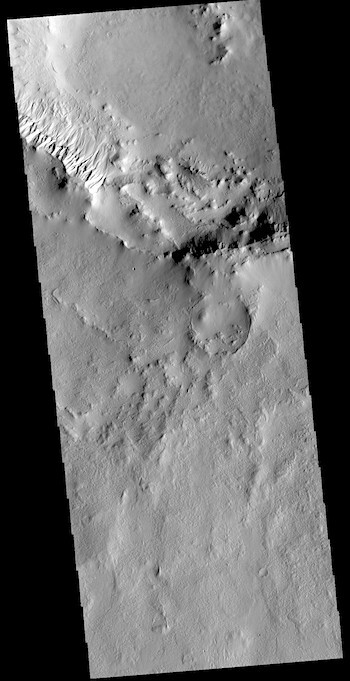 This VIS image shows part of the rim of an unnamed crater in Terra Cimmeria. 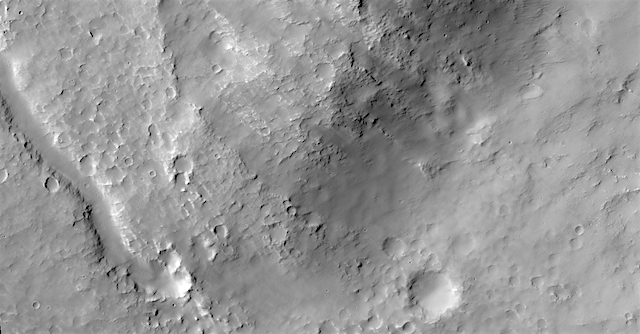 A group of channels dissect the rim near to upper left of the image. These channels are called gullies due to being on a steep slope rather than a flat river plain. With careful examination, it is possible to see a boundary layer between the upper incised gully and a lower deposition region. The boundary marks a change in slope, the steep upper portion supports fast moving fluid that carves into the rim eroding materials. The change to a flatter slope causes the fluid to slow down and as it slows the materials carried by the fluid a deposited. Side by side. 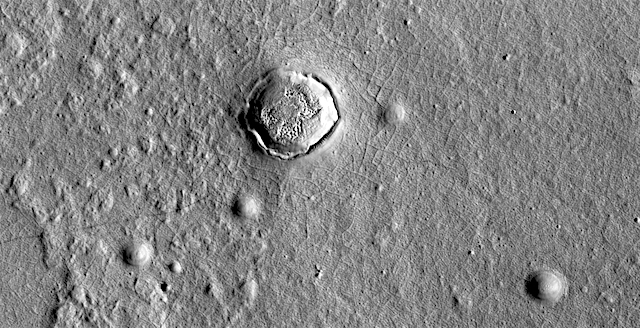 The objective of this observation is to examine a small channel that has cut through a crater north of Hellas Planitia. Sol 2384, April 21, 2019. 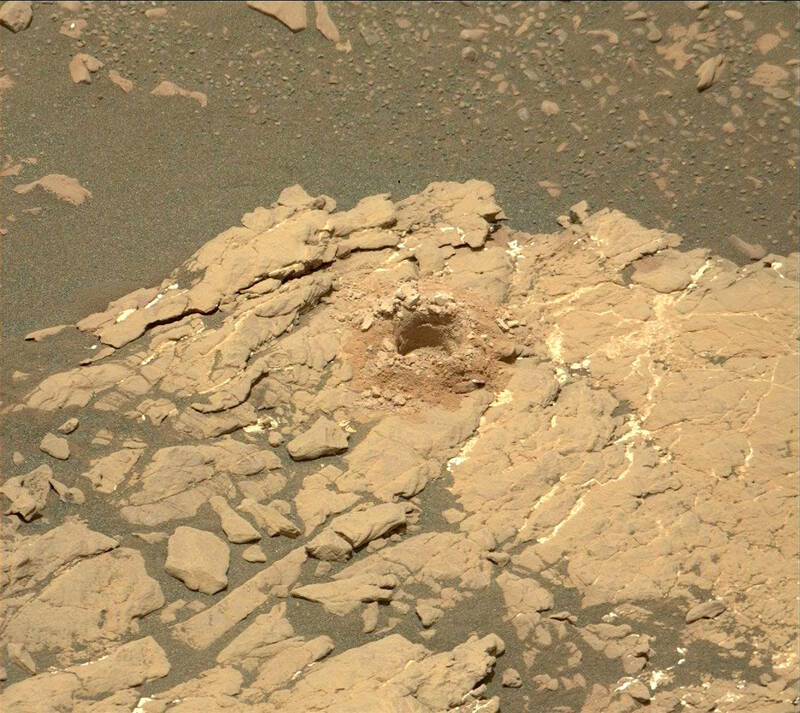 The Mastcam (100mm lens) took this image of the Kilmarie drill hole, which it appears may be shallower than Aberlady. Click the image to enlarge it. 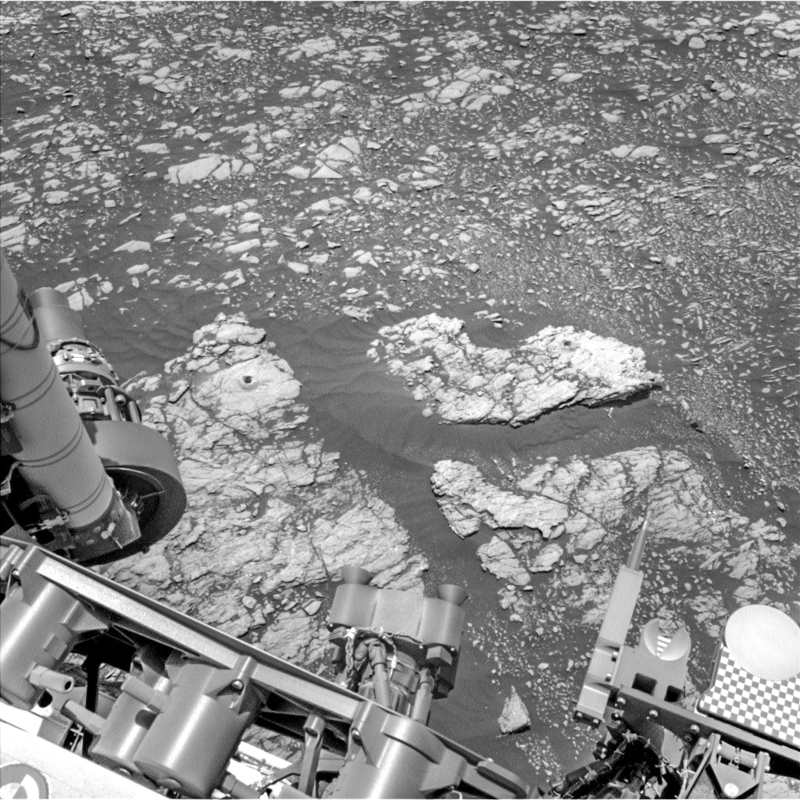 Sol 2384 raw images (from all cameras). THEMIS Image of the Day, April 23, 2019. This VIS image shows large individual dunes on the floor of Kaiser Crater. Small dark lines to the right of the sand dunes are the tracks made by dust devils as they move along the surface. Kaiser Crater is located in Noachis Terra. Sol 2384, April 21, 2019. 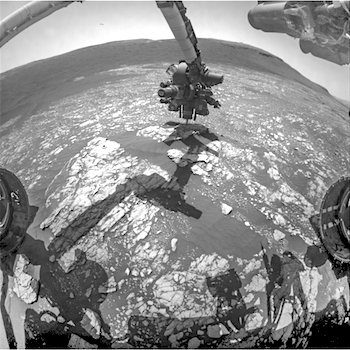 Successful drilling at Kilmarie puts two drill holes in the same Navcam frame. Aberlady is on the left, Kilmarie on the right on what may be a separate piece of bedrock. Click the image to enlarge it. Quite smoooooth. Here in Deuteronilus Mensae, there is a smooth geologic unit overlying plains material. There are also slightly convex-up edges, polygonal patterns on the surface, and softened craters. THEMIS Image of the Day, April 22, 2019. Today’s VIS image shows the floor of Matara Crater. A large sand sheet with surface dune forms dominates the floor of this crater located in Noachis Terra. The dunes’ dark tone indicates a lack of dust, which is light in tone. Thus the dune sands are probably active and moving under the wind.